This coffee cake is so delicious. It's especially scrumptious when eaten warm and served on a chilly autumn or winter's morning. Just like eating those "sticky buns" we all know and love, but in cake form. Preheat oven to 350 degrees F/180 degrees C. Spray a 9-inch round cake pan with nonstick spray. Stir together brown sugar, cream, and salt for the caramel. Pour into prepared pan and spread to coat the bottom. Sprinkle pecans over the caramel. Process brown sugar, flour, butter, cinnamon, and salt for the streusel in a food processor. Pulse until small clumps form; set aside. Whisk buttermilk, yogurt, and eggs together for the cake in a measuring cup with a pour spout. Sift flour, baking powder, soda, and salt onto a paper plate. Cream butter and sugar with a mixer just until combined. Alternately add dry and wet ingredients, starting and ending with the dry. Blend each addition just until incorporated. Spread half the batter over the caramel, then sprinkle with half the streusel. Carefully spread remaining batter over that and top with remaining streusel. Bake 50 to 60 minutes, or until a toothpick comes out clean. Cool cake for 5 minutes on a rack, then run a paring knife around the sides to loosen. Invert onto a serving platter while hot, then let cool slightly before slicing. Due to the sticky top, use a sharp, thin-bladed knife to slice the cake. Preheat oven to 350 degrees F/180 degrees C. In a shallow, foil-lined pan large enough to hold pecans in a single layer, toast pecan halves just until light golden and fragrant, about 10 to 13 minutes. Stir occasionally, and watch carefully! (nuts can burn quickly). Remove from oven and set aside to cool until ready to use. Unbelievable!! This is sinfully good!! This will become a weekend breakfast and brunch favorite. i made this recipe. it tasted great but looked nothing like the photo.. the caramel actualy mingeled with the cake.. why? 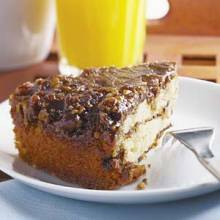 This is the best Sticky Bun Coffee Cake!!! Everyone totally loves it...sweet, but the perfect type of cake for any time during the day. I absolutely love this cake for breakfast with a cup of tea because i'm not much of a coffee drinker. Trust me, it is a "must have" on those early morning Sunday breakfasts.